Yo’ Mama! 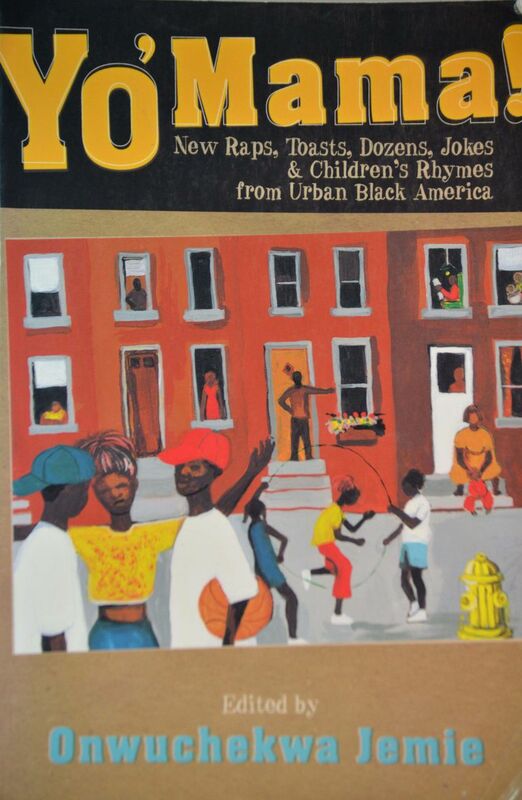 New Raps, Toasts, Dozens, Jokes, & Children’s Rhymes from Urban Black America, ed. by Onwuchekwa Jemie (Temple University Press, 2003). A game of put-downs: the rapid, ritualistic exchange of insults, often targeting family members. The rhetorical contest of playing or shooting the dozens (also known as capping, ranking, and sounding) is most commonly practiced by young African-American males. In "The Dilemma of African-American English Identity," Kofi Dorvlo notes that "a careful examination of the 'dozens' reveals African language influence on AAE which is hard to ignore" (Identity Meets Nationality, 2011). See Examples and Observations, below. Your mama's so FAT, after she got off the carousel, the horse limped for a week. Mo's rebuttal: Your mama's so skinny, she can hula-hoop through a Froot Loop. Your mama's so FAT, her blood type is Ragu. Mo's rebuttal: Your mama's so skinny, she looks like a mic stand. Your mama's so FAT, instead of 501 jeans she wears 1002s. Mo's rebuttal: Your mama's so skinny, she turned sideways and disappeared. Your mama's so FAT she's not on a diet she's on a triet. What y'all eating? I'll try it. Mo's rebuttal: Your mama's so skinny, I gave her a piece of popcorn and she went into a coma. Your mama's so FAT, when she jumped in the air she got stuck. Mo's rebuttal: Your mama's so skinny, you could blindfold her with dental floss. "The dozens is usually played by two young black males, often surrounded by an interested and encouraging audience of peers in which the players insult and provoke each other with put-downs of each other's mother or other female family members. This process teaches one to take insults in stride while encouraging verbal retorts. . . . The dozens is played more often and more intensely in urban ghettos where frustrations are greater and the strategies of the ghetto are appropriate in a zero-sum game; neither player really wins. The dozens works when the players share a common ethnicity, a degree of connectedness, and acceptance of the activity for what it is--a game (Bruhn and Murray, 1985)." "Alan Dundes found that the social and artistic are infused in the Afrodiasporic practice of the dozens, which he notes functions both as an assertion of masculinity and as a rite of passage for the secular mastery of words. The dozens not only establishes a framework for verbal creativity; children also use them to determine a social hierarchy. A good dozens player not only cooly withstands merciless insults to his family; he also twists memorized insults quickly to suit the opponent at hand." "While retaining the form and spirit of the West African original, African-American dozens has elaborated the witty one-liners into complex verbal war games involving huge armories and modes of attack and defense undreamt of in the homeland. It is a case of Darwinian adaptation for survival of the species in the killing jungles of slavery and racism. The mother remains the central figure. By learning to deal with verbal abuse of her, the modern black youngster learns to endure the historical, real-life abuse. It is as if the system is inoculated with virtual (verbally imagined) strains of the virus, thereby gaining immunity and new health in spite of the reality on the ground."